Parenting Coordination – In a high-conflict divorce, children are the unintended victims. However much the divorcing couple may claim to put the interests of their offspring first, very often children as used as pawns or bargaining tools between warring parents. Depending on the age and mental constitution of the children…and the severity of the conflict, this can have lasting psychological consequences for the young people involved. Parenting coordination aims to remove the children from the divorce equation and ensure their welfare is prioritised, regardless of the financial and emotional chaos that may surround the divorce proceedings of their parents. When is parenting coordination used? Although there are exceptions, generally a parenting coordinator is appointed by the court in situations where divorcing parents are highly litigious and where it appears that the process is going to be lengthy. While most people want to get the divorce behind them as quickly as possible, some high-conflict couples find compromise difficult and, either unwittingly or intentionally, seek to prolong the process. Some individuals are addicted to emotional upheaval and unconsciously thrive on the discord. Children of these parents need the protection of the courts. A coordinator is appointed where there is clear evidence of an inability or unwillingness on the part of the parents to make healthy parenting decisions, to comply with official parenting agreements, to reduce their child-related enmity, and to protect their children from the fall-out of their disagreements. A parenting coordinator is either appointed by court order (this can be with or without the consent of the parents), or is part of a parenting plan agreed between divorcing parents that has been made an order of the court. The court order or parenting plan should spell out the extent of the parenting coordinator’s authority. In some cases, the coordinator is granted decision-making powers. Where that is the case, the nature of the decisions the coordinator is empowered to make must be clearly articulated, i.e., are they minor issues such as timetabling or major issues such as relocation? In other cases the role of the coordinator is simply to assist with the implementation and monitoring of the parenting plan between the parties. Can either party refuse parenting coordination? Because a parenting coordinator is only appointed when all attempts at reasonable dialogue between the parents have failed, and the parenting coordination is part of a court-imposed arrangement, parents cannot refuse the involvement of a parenting coordinator. The court has the power to appoint a parenting coordinator without the consent of the parents, if the welfare of the child or children is a matter for concern. When it comes to the choice of professional, the parents may have the option of appointing a coordinator by agreement, but if they can’t agree on the individual, the court may step in and select a coordinator on their behalf. Alternatively, a local mediation organisation might be authorised to choose one. Even where the parenting coordinator is “imposed” on a couple, it is very important that the selection be made with sensitivity for all the personalities involved. A parenting coordinator should be suitably qualified in terms of training, experience and education. A coordinator should have completed a basic 40-hour mediation training programme and be accredited by the National Accreditation Board for Family Mediators (NABFAM) through a local mediation organisation such as FAMAC, the South African Association of Mediators (SAAM) or the KwaZulu-Natal Association of Family Mediators (KAFAM). In addition, a coordinator needs to have worked extensively with high-conflict families. Most coordinators are psychologists, social workers, mediators, family law attorneys or retired judges. SD Law & Associates are experts in divorce and family law and have dealt with many high-conflict divorce cases. We have experience in working with parenting coordinators and ensuring the interests of children are protected. 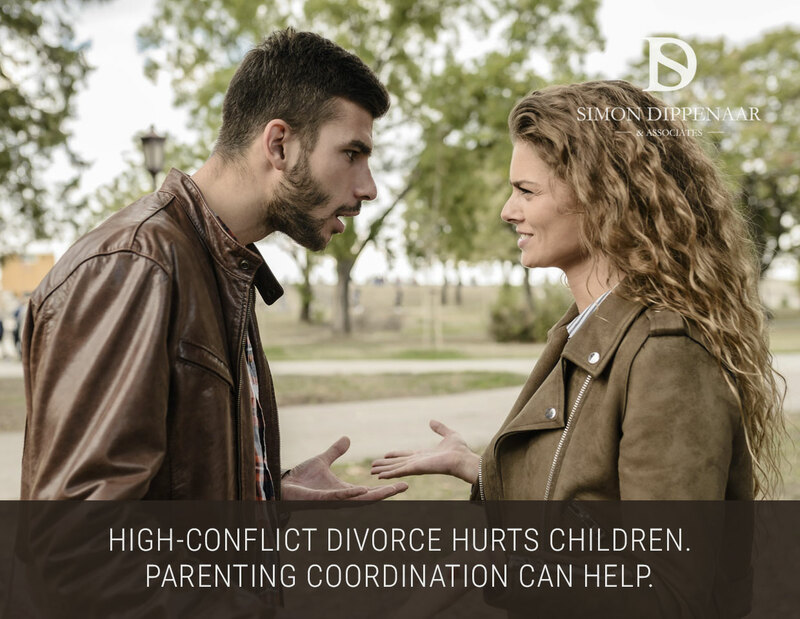 In many cases, we can help you resolve your conflict without resorting to parenting coordination. Where a parenting agreement and the appointment of a parenting coordinator are necessary, we can guide you through the process. If you are considering divorce and are worried that your partner may be obstructive, or just want to discuss your options, contact us on 086 099 5146 or 076 116 0623 or contact us. Your enquiry will be dealt with in the utmost confidence. For more about the rights of an unmarried father click here. For more about abusive behaviour click here. For more about divorce and annulment click here. For more about the divorce process click here. For about choosing the right divorce lawyer click here. For more about the benefits of divorce mediation click here. For more about last wills and testaments click here. For more about foreign divorce in South Africa click here. This entry was posted in Parenting Coordination and tagged divorce, facilitation, parenting coordination. Bookmark the permalink. ← Married abroad? Make sure your marriage is legal in South Africa.